Summer in Rome can be scorching. But tourists tempted to seek respite from the heat by taking a dip in the city’s historic fountains will be hit by a fine of $350. The new decree was announced on Monday by mayor Virginia Raggi, after a spate of cases in which visitors stripped off and plunged into centuries-old Baroquefountains. 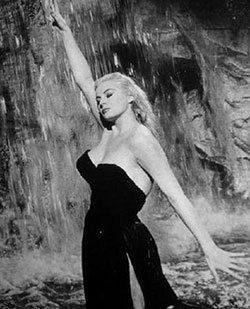 The decree prohibits tourists – and Romans, for that matter – from paddling or swimming in 40 historic fountains, including the famous Trevi Fountain, immortalized in the 1960FellinifilmLa Dolce Vita, in which Swedish actress Anita Ekbergwaded into the thigh-high water (thereby setting a terrible example). Tourists are also banned from eating or drinking while sitting on the edge of the fountains, clambering over them or allowing pets to drink from them. The combination of high summer temperatures and inviting-looking fountains has proved too much for many tourists in the past, with numerous cases of visitors immersing themselves in the water, including an Ekberg imitator who wade into the Trevi in an evening dress and fur stole. That got her are fine of nearly $700.